We’re almost at the end of the week but I’m actually able to post a true “Throwback Thursday” type blog. Using the rousing tunes of The Rolling Stones, I bring products from two new events to life. That’s how I’m going to start out this entry is by giving you some new news concerning the blog which I feel is really good for me personally as I continue to grow and see things prosper. I’ve been accepted as an official blogger for The Men Jail event which begins its new round tomorrow, June 08th. The event has so many different products from clothing, to furniture, as well as tattoos. There’s so many different things for just about everyone so I’m proud to be affiliated with it and that they think I do a good enough job that they want me to represent them as well; I hope that it will be just like my other partnerships that are very nicely matched. There are several items I have in this post from the event but the one I’m focusing really one the most in my main story shot is the pose which is from a set by Kokoro Poses called “Henrique”. It has 5 different static bento poses that will easily be able to fit your own blogging and photography needs whichever one you might possibly partake in (or could be none as well). 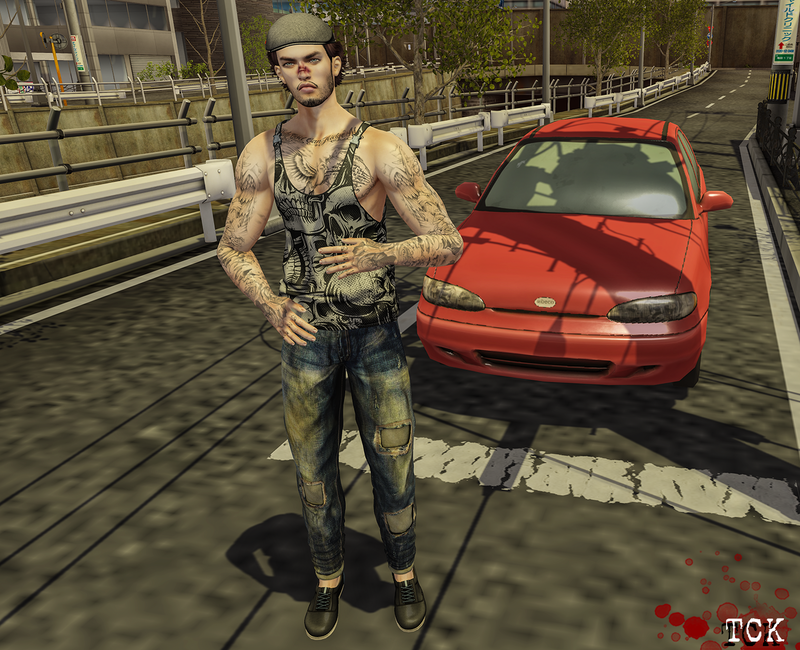 The item that makes me correlate with the soundtrack of this post is the “MICKEY” skinaddon from [FLAWS] that makes me more of a “Street Fighting Man” this applier which comes available for CATWA and OMEGA allows you to place a fresh or head gash on your nose. 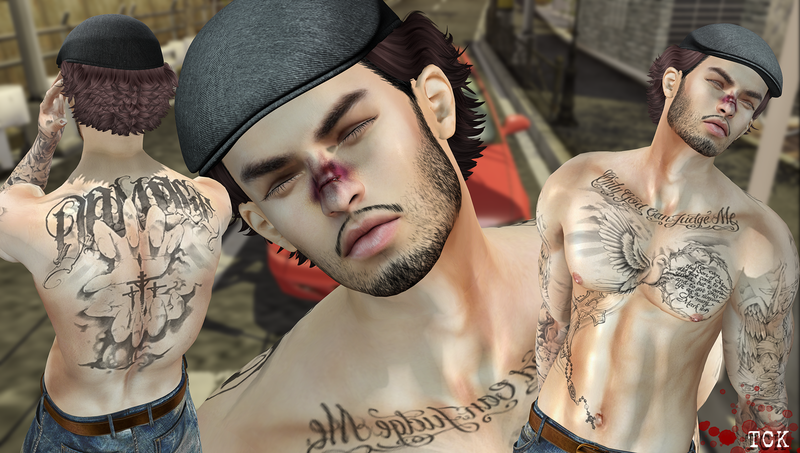 Of course what ruffian wouldn’t come to the party without a busted up face of some sort…that’s what being a tough guy is all about! It’s been a while since I’ve worn any tattoos in photos but this time I felt that if I was going for a tough guy look that I needed some ink and it just so happens that Facade is releasing a new tattoo at TMJ called “Salvation” it has both fresh and faded version with a HUD that will apply to all major mesh bodies as well as OMEGA so that no matter what you are covered to wear this tattoo on your person. I think that it has an element of a prison tattoo but isn’t as rough as some of them tend to look which probably says that it is a post prison tattoo? I’m rambling a little bit too much on this so I am going to move on to the next bit. Last for my goodies from The Men Jail is the “Erick” facial hair from Clever Language and I would have loved to see how it would have looked with the nose cut but my CATWA head just was not being friendly with me and kept pulling one or the other off when I tried to apply despite trying to use different layers for them both which gave me a solid reason to break out my LeLutka head because both applied without any problems whatsoever. If you aren’t planning on wearing these two products together or can figure out a fix by all means let me know because I’d appreciate it. This facial hair applier comes with both a CATWA and OMEGA friendly applier with a black hair version as well as tintable for those of you who have varying colors of hair. The Men Jail runs until the 28th of June so find some time during your next shopping trip to take a look through what is all there is to offer fellas. At the beginning of the post I mentioned that not only was I featuring The Men Jail products but also The Vintage Fair which also starts tomorrow (June 08th) and I was able to get a sneak preview of the event and while not every designer was set up at the time, I did manage to bring home a new hat/hair combo that I thought really started my thought process going of putting a look of a tough guy together. Lock&Tuft will have for sale the “Cutler” hair which has a flatcap as part of the product. It’s been a while since I’ve seen a cap like this and it’s cool that it’s been paired with longer hair in the back. It reminds me a little bit of former lead vocalist from the rock group AC/DC who was known for having at hat like that as well as hair in that kind of style. I purchased the FATPACK which gives all of the colors as well as a HUD that allows you to change the color of the cap. Now that I’ve covered the majority of what I feel were my key thought points it is time for me to put this blog post to bed allow you to get prepared to start the weekend and planned shopping trips. Check back in soon for more bloggage and cool new and recent releases from brands that I believe in highly. Also one quick thing is this is the second straight post that I’ve visited the sim, Rieri Town in Tokyo which is a really excellent place to explore and for fellow photographers/bloggers you’ll enjoy exploring and finding your own spot to snap a photo. JEANS: HEVO – Patchwork Jeans DARK B. Next Post [#495] Feeling Hot, Hot, Hot!